One of the things I like about some more historic versions of the Bible is their poetic language. I know not everyone will agree and some struggle to understand the older translations, so this is purely an individual observation. Modern language translations and paraphrases also have an important place and personally I enjoy consulting a variety of Bible versions, old and new, to catch the full panorama of what the writers were trying to convey. The phrase Paul uses to convey his revelation takes us back to Genesis 2:23 and Adam’s announcement: ‘This is now bone of my bones and flesh of my flesh; she shall be called woman because she was taken out of man.’ The first bride, Ishshah (woman), was formed by God from the very physical substance of the first man. (Ishshah was not called Eve until after the Fall.) She was not a separate creation to the man, as many believe. The Hebrew word used to describe her formation by God is ‘banah’, meaning to build, rebuild or establish, and implies a continuation of something already begun (Gen. 2:22). It is not the same word used for humanity’s creation in Genesis 2:7, which is ‘yatsar’. An enduring truth we learn from the New Testament is that God reveals spiritual revelations first through natural circumstances (1 Cor. 15:46). Jesus is the second Man and the last Adam (1 Cor 15:45-47). Just as the first bride was formed of natural substance from the opened side of the first Adam, so was Christ’s Bride brought forth from His spiritual substance when blood and water flowed from His pierced side at Calvary (John 19:34). Genetically you can’t get any closer to a person than being their flesh and blood. 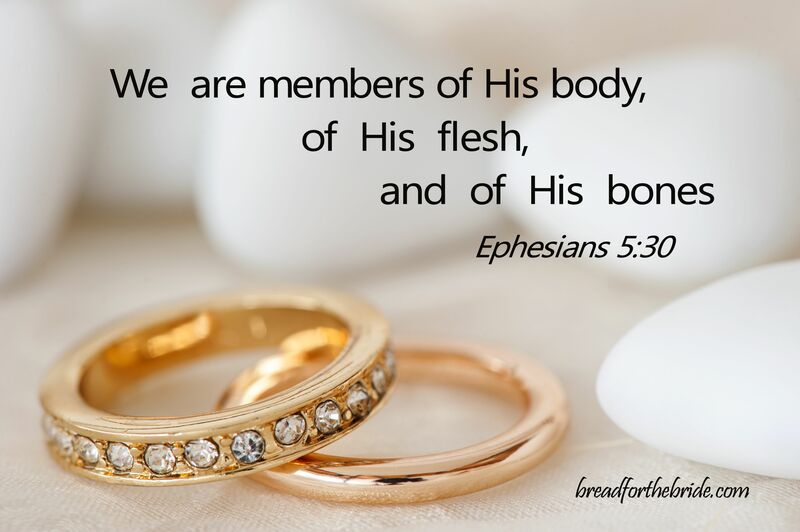 In using the phrase ‘of His flesh and of His bones’ I believe Paul wanted to bring the church to the realisation that Jesus looks on His Bride not as separate to Himself but as an essential part of Himself, more intimately connected to Him than anything else in all of creation. Genesis 2 continues: ‘Therefore a man shall leave his father and mother and be joined to his wife, and they shall become one flesh’ (v.24). This blueprint for human marriage, which is an imperfect shadow of Christ and His Bride, was reaffirmed by Jesus under questioning from the Pharisees in Matthew 19:3-6. It is not the first Adam and his bride that I want to focus on in this post, but reviewing some of the events in Eden is helpful in understanding our own role as Christ’s Bride. The story of Adam and his bride Ishshah is only a foreshadowing of the more perfect and wondrous oneness that Jesus intends to establish between Himself and His perfected Bride. Jesus, as the last Adam, left “His father and His mother” – God. (And yes, God is both Father and Mother in the sense that He encompasses what we ourselves have neatly divided into male and female qualities). Jesus, like the first Adam, experienced a deep sleep in the tomb and while His human body slept God was busy building another body: the spiritual Body of Christ we call the church. God specialises in bringing form out of chaos. Amid all the confusion, fear and despair of those hours between the death and resurrection of Christ, the young church, having come forth from the opened wound on His side, was being formed. Jesus came not only to offer salvation but to ‘be joined to His wife’. This phrase “be joined” does not accurately convey, in the English, the true depth of its ancient meaning. It means to be stuck together like glue, cemented, or to be fastened to one another as two oxen were yoked with the same yoke. Perhaps this is what Jesus had in mind when He told us His yoke was easy (Matt. 11:29-30). ‘This is bone of my bone and flesh of my flesh’, proclaimed Adam. But in Christ, the last Adam, the order has been reversed: we are of His flesh and of His bones. Bearing in mind that the natural comes before the spiritual, in the first Adam’s statement bone came before flesh. Bones are the rigid inner structure of the body, representing the Old Covenant with its inflexible framework of law inscribed on hard and impersonal stone tablets. The flesh nature, the part of us that houses the heart and the individual personality, characteristics and disposition, is mentioned second, symbolizing the New Covenant relationship of grace instituted by the second Adam, Christ. The law of the Spirit is now written on our fleshly hearts and fulfilled in us by Christ Himself. That is why in Christ, the order has been reversed and we have become ‘of His flesh and of His bones’. This ‘flesh and bone’ Bride was hidden in Christ from before the foundation of the world (Matt. 25:24; Eph. 1:4), even before the creation of Adam and Ishshah. She is being made ‘one flesh’ with Him, not through natural means but through His Spirit. We acknowledge this every time we partake of the bread and wine that symbolically represent our Bridegroom’s flesh. The place Christ has reserved for His Bride could not be any closer or any more intimately connected to Him. He has prepared her a royal table and calls her to sit with Him there, even in the thwarted presence of her defeated spiritual enemies. At that table He pours out His Spirit abundantly upon her, in an unending anointing of His own divine essence. He clothes her richly in His own righteousness and gracious mercy, and provides her a dwelling place with Him into an eternity which God has ordained they will cohabit (Psalm 23:5-6). Once and for all, two shall be one, not in the flesh, but in the Spirit. Yes, it is a mystery, but a glorious mystery being unfolded in and upon us, even now. Selah!